Caliber Outdoor Products offers a fish hook remover that is specifically designed to free a gut-hooked fish without causing additional injury to the fish. 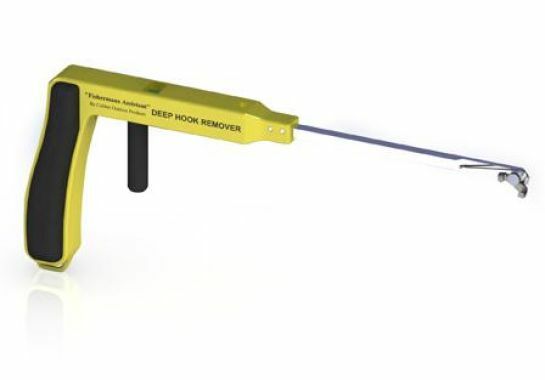 In addition, with the price of today's increasingly expensive hooks, the "Fisherman's Assistant" Deep Hook Remover will pay for itself over time. The product was developed, tested and proven by anglers to reduce fish mortality by dislodging and flipping the hook 180 degrees for easy extraction. It can remove all types of hooks, including circle and J-hooks, even if your line is already broken off. The Fisherman's Assistant is made of non-corrosive materials to handle the harsh saltwater environment, the cable is replaceable (with basic 90-pound coated stainless steel fishing wire) and it even floats. It will tackle any size hook up to size 9/0. Check out their website for additional information and videos.